Heat a large Dutch oven over medium-high heat. Add olive oil to pan; swirl to coat. Add onion, carrot, and celery, and sauté 6 minutes or until tender. Stir in 1/4 teaspoon salt and garlic; cook 1 minute. Stir in 3 cups vegetable broth and kale. Bring to a boil; cover, reduce heat, and simmer 3 minutes or until kale is crisp-tender. 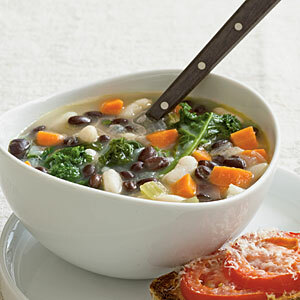 Place half of cannellini beans and remaining 1 cup vegetable broth in a blender or food processor; process until smooth. Add pureed bean mixture, remaining cannellini beans, black beans, and pepper to soup. Bring to a boil; reduce heat, and simmer 5 minutes. Stir in remaining 1/4 teaspoon salt, vinegar, and rosemary. Made this yesterday…. and had it today for lunch. Turned out great. Thanks so much for what you do and your work on this site.